If you’re only interested in the conclusion from a gastronomic perspective the take home message was that the reduction time has a significant impact on flavor. For more flavor you want to do a slow reduction over low heat (see illustration below). But you should not overdo it as this will result in bitter and burned flavors. A reduction time of 15-20 hours seems to be optimal. The simple explanation is that with a high power input volatiles evaporate from your stock pot before they have time to react to generate new flavors (for instance in Maillard type reactions). Pia’s thesis (free download, 0.7 Mb) has two parts. The first is an introduction to molecular gastronomy, and frankly this is the best introduction that I’ve read to date on molecular gastronomy! The second part covers preparation of meat stocks with and without red wine. The boiling points illustrate that category 1 is driven off fast due to lower boiling points whereas category 2 will evaporate very slowly (and possibly only be removed through an aerosol). The last category has lower boiling points suggesting that these compounds were not present from the beginning and are only formed after an extensive reduction. 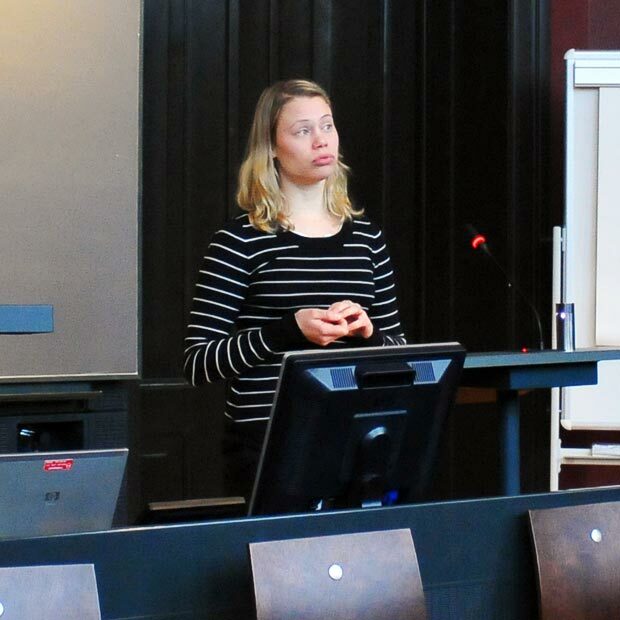 In the power experiment she studied the effect different power inputs (corresponding to reduction time of 4-30 h) have on a stock reduced to the same concentration factor. The resulting flavor profiles were very different with a key result being that a high power input results in a rapid loss of volatiles. A slower reduction leaves more time for new flavors to develop. 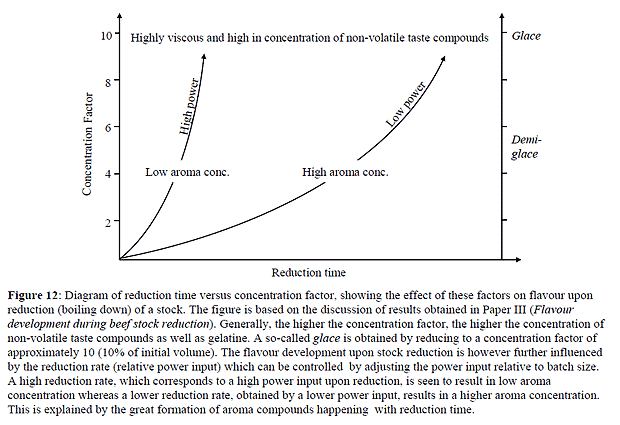 Further details can be found in the thesis and in the paper Flavour development during beef stock reduction . 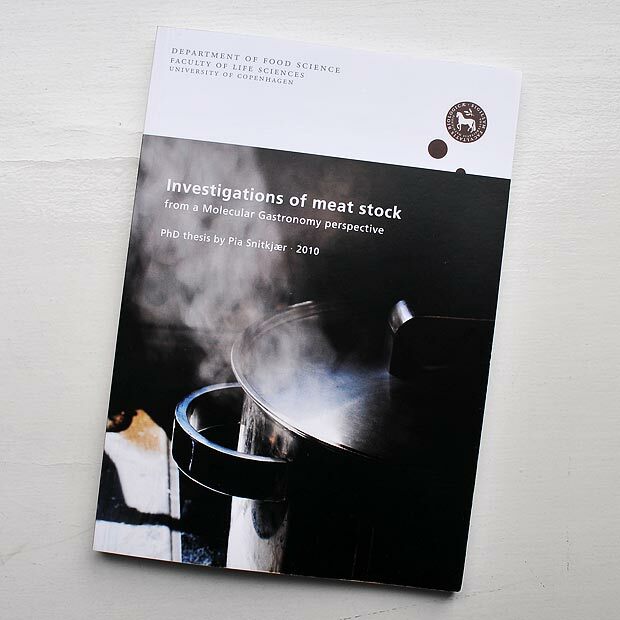 There was no time to go into details of her second research paper on red wine in stocks, but the results have been published: Beef stock reduction with red wine – Effects of preparation method and wine characteristics . An important finding was that wine and stock should be reduced together, not separately – this diminished the astringency from the tannins, most likely due to precipitation of insoluble protein-tannin complexes (just like the ones which make Norwegian egg coffee easy to drink). Furthermore it was shown that the initial differences in the aroma profile of the wines was partly eliminated by boiling. The choice of wine however still had an impact on the resulting flavor because the non-volatiles such as sugars, acids and phenolics of a wine did influence the end result. More specifically a reduced stock made with Zinfandel had bread, herb, wine-vinegar and chicken notes whereas a reduced stock made from Cabernet Sauvignon was dominated by beef and onion odors accompanied by a “salt taste and a significantly higher intensity of particulate mouthfeel and bitter taste”. Hi, sounds very interesting, but I can’t get the links to Pia’s thesis to work out? These results (although probably not very surprising) have their direct parallel to cooking/production of Norwegian brown “cheese” called brunost. This is produced by boiling in whey until brown and most water has evaporated. Lots of maillard and caramelization products. cooking large baches results in much darker and stronger-flavoured product compared to small batches, which turn out lighter and milder. Furthermore, brown cheeses from different regions in Norway traditionally have different colour and flavour partly due to batch size. Areas with historically large farms with many animals gave large batches and hence darker product (typically eastern inland Norway, Gudbrandsdalen), whereas parts of the country characterized by small farms with just a very few animals would traditionally have lighter and milder varieties (typically western along the coast). Restaurant where I use to work , we made demi took us 5days, we never roasted the bones, lightly caramelized the onions near the end around day 3/4. and Reduced slowly.